Rarick’s life-long love of golf helped upgrade the sport in Tucson. A native of Iowa, Rarick was the youngest golf pro in the state at age 17. His pro career was interrupted by World War II. His plane was shot down over the North Sea on a bombing mission and he suffered a broken back, neck and ankle. He spent 11 months as a prisoner of war and earned the Silver Star and other awards. After moving to Tucson he became deeply involved in youth golf and the Tucson Open. He brought the professional golf tour to Tucson in 1945, and until the Conquistadores took over in the 1960s he was the driving force behind the Tucson Open. He also was one of the founders of the Sportsmen’s Fund of the Arizona Daily Star. 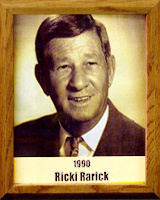 Rarick was an extremely generous man, both giving of himself and material things. He obtained pleasure from both and asked nothing in return. He always pulled for the underdog, using his business contacts to find jobs for more than 100 youths over the years, going to court if it could benefit someone in trouble, or just keeping his hand in his pocket ready to give to anyone in need.